I participated in a Newark Night Patrol last night and it was terrific! You meet excellent people and are doing your small part to help the community of Newark. For those of you in the New Jersey/New York area, I highly recommend coming out every Monday and Friday at 7pm for the rest of the year. Mayor Cory Booker and Director of Public Safety Anthony Campos are leading this initiative. Volunteers drive around Newark in caravans led by off duty officers doing patrols of presence throughout the city. 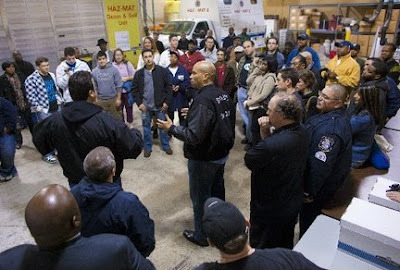 Night patrol volunteers meet at the Newark Fire Department Special Operations building at 191 Orange St. at 7:00 P.M every Monday and Friday. To contact the iVolunteer Night Patrol dial 973-733-8108.